Description: A creative rabbit who turns a box into anything and everything. He makes it clear that it’s NOT a box! Why I like this book: Great for discussion about flexibility. While reading, kids love to make guesses as to what it could be next. After reading a couple pages, see if kids can guess what it could be next? What could he be standing on? What could he be sitting in? 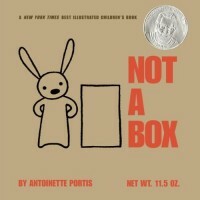 After reading the book, give kids their own box. What can they turn it into? If struggling to come up with ideas, have them act out the ideas in the story. Add on to the sequence. First it’s a car. Where will they drive to? What will they do next? 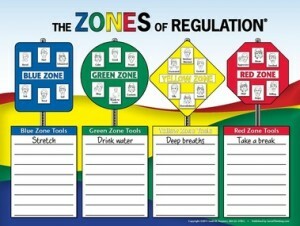 Great for working on pretend play schemes and sequences. In a group? Give each kiddo a piece of paper with a square (box). Give them 10-20 seconds then have them FREEZE. Switch papers. Give another 10-20 seconds. Exchange as many times as you’d like. Have kiddos talk about how their idea was changed. Great to discuss how we all have DIFFERENT ideas in our head. This can be challenging for our friends who struggle with flexibility…but a great exercise. If changing their own picture is too challenging, you can just have 1 box, and each add to it. A good exercise to discuss how teamwork can make a cool picture! Great for modeling question formulation and auxiliaries (i.e. Why ARE you sitting in that box?, What ARE you doing on top of that box? etc. ) You can modify these for your use. Have the kiddos ask the rabbit. Description: Piggie and Elephant plan to play catch when another friend (snake) wants to join in. They are struggling to figure out how include snake because he doesn’t have arms! They work together and after some failed attempts, come up with a solution! Why I like this book. 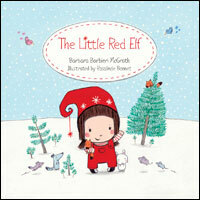 : A wonderful book to teach friendship. They don’t quit until they can find a way for everyone to be included and happy. A great book for reading body language. Use cut out thinking bubbles and discuss how characters are thinking and feeling and why. Read to a social group. Discuss how everyone was included. Great book to read when working on tone of voice. Have the kiddo “act” as a character, and read their lines with appropriate tone of voice and body language. Talk about flexible thinking. After trying the same solution to the problem over and over again, how did Piggy come up with a totally novel idea? Talk about other ways this problem could have been solved. Create a “problem” in a game and have the kids solve it to practice including everyone. When snake was accidentally hurt, he didn’t get angry because he understood his friends were trying to help. Talk about intention and attitude with kids. This is especially important for kids who have trouble reading body clues and for kids with sensory modulation issues. Description: A story of perspective. Is it a duck? Is a rabbit? It all depends on how you look at it! 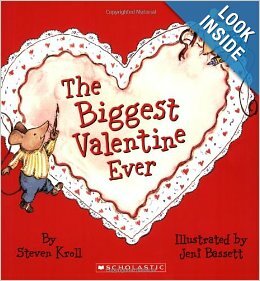 Why I like this book: It’s a great model for perspective taking, fun illustrations, and kids love it. It always gets kids talking, and in social groups with each other (which is often the goal)! It’s a great model when teaching kids about flexibility, and that everyone has different ideas. A great compliment to Michelle Garcia Winner’s Unthinkable Program© (Social Thinking© ) when introducing “Rock Brain” (a character who is inflexible). Draw an abstract shape (anything will do, oval, cloud shape, square, etc.) and make copies. Give to kids and have them turn the shape into something. See how many different ideas there are, and how there are no right answers. We all have different ideas in our head. 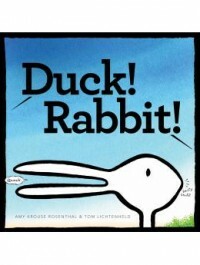 Great book to discuss tone of voice with early elementary kids and older. The dialogue in this story is great for modeling how we say things. Have students try the dialogue and try different tones of voice. Sarcastic, angry, friendly/joking….and different situations when that would be expected/unexpected (language from Social Thinking©).